For some time I had been toying with the idea of switching over to work mostly with hand tools, which put things like chisels and hand planes on my radar. In the midst of reading opinions and reviews I happened to be in a local junk shop when I spied a Bailey no.5 languishing on a low shelf. It wasn’t in particularly terrible shape, but it was rusty on the surface and dusty on top of that. “How much for the plane?” I asked. “The what?” said the proprietor. “This thing?” I said raising it up. I still remember bringing it home and trying to dismantle it. Everything was frozen so I ended up spraying it down with WD-40 and then trying again later. Success! I stripped it down, flattened the sole, polished it up and sharpened it to within a micron of its life. Thus began my sordid tale of living hand-tool to hand-tool, sneaking a smoother in the garage when possible, and lugging home a hand saw when no one was looking. I was hooked for sure. 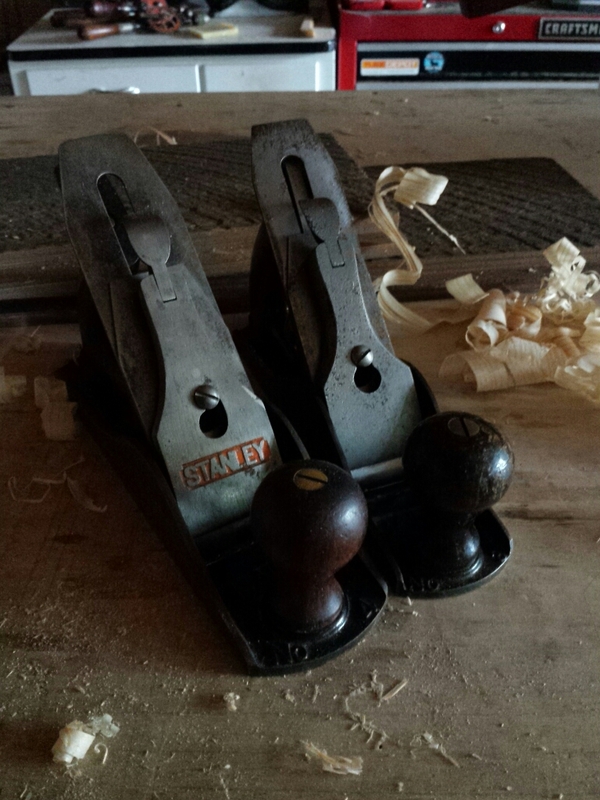 Within a relatively short amount of time I had a rudimentary but working set of hand tools based around that jack plane and a couple of no.4 planes I had purchased as a pair. This kit did just fine for a while, until I started really examining how I worked and thinking about my limitations and struggles. 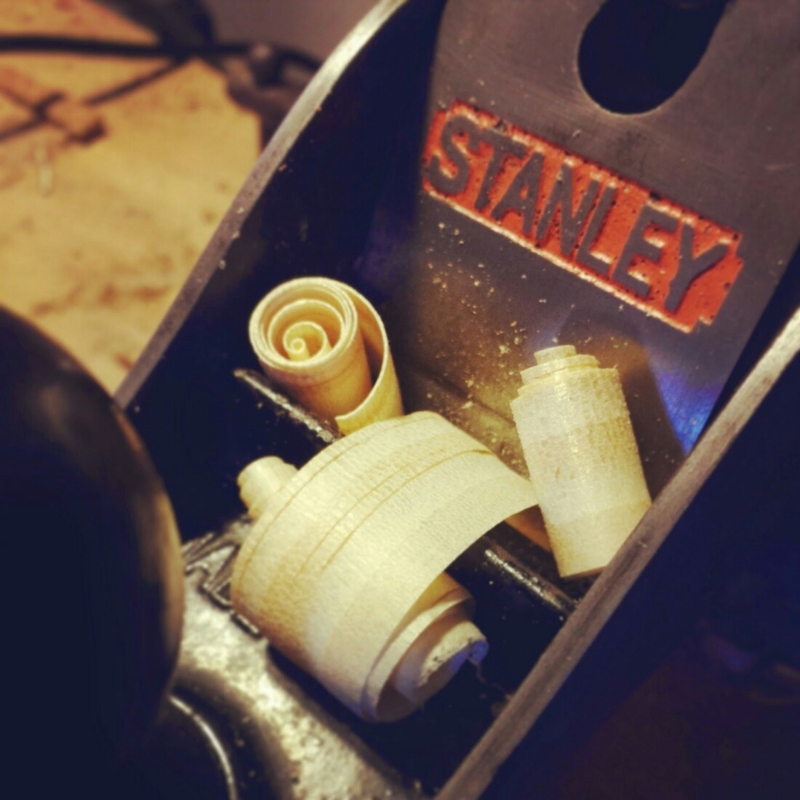 A good block plane or two was next on my list. And then a jointer. You know how this story goes. I can currently (and honestly) say there are more planes in my shop than I need. They’re different makes and models but I have a handful of block planes, nos. 3-7 bench planes (including two 3’s and two 6’s) and I’m getting to the point that I have to answer that same question we all do from time to time: User or collector? I bought a no. 5 because it was there and everyone said it was the place to begin, but honestly it doesn’t get much use. 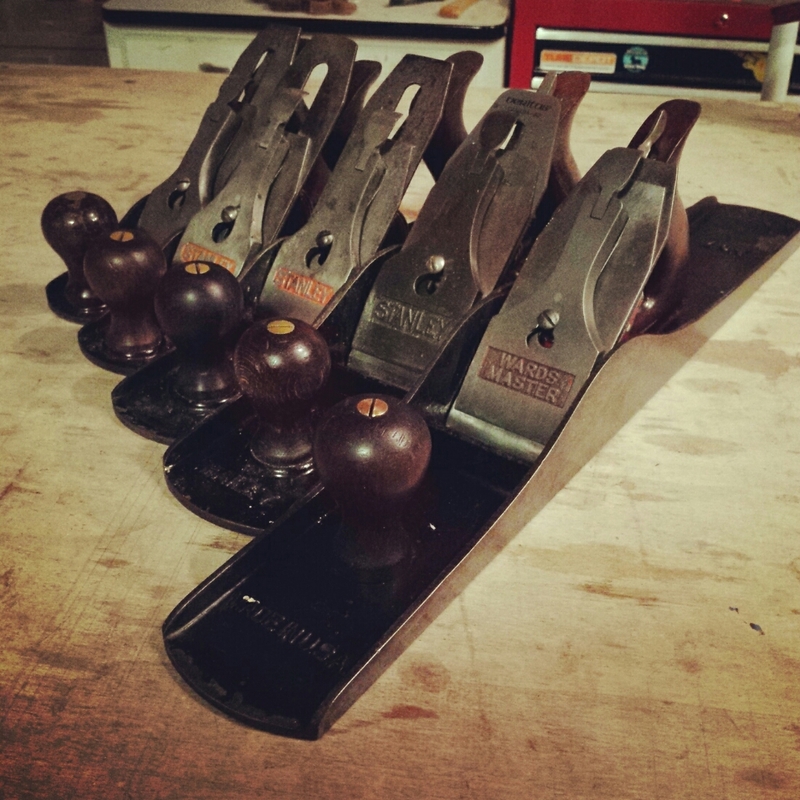 My no.6 is my “jack” plane most of the time. I bought a no.4 because that seemed like the go-to smoother that everyone had. But, ever since I purchased a Lie-Nielsen 4 1/2 and rescued an old Stanley no. 3, the no. 4 has been sitting the bench. Sitting the 4 1/2 aside for a moment, I’ve learned that the no. 3 is more efficient and useful to me for almost all other smoothing tasks than the no. 4. This isn’t universal, but in my hands, the 3 is the better tool. I can use it like a block plane with better leverage. My general purpose smoother is the 4 1/2 to be sure, but when I need to sneak up on a trouble spot or smooth the edges of a picture frame, the 3 is where it’s at. So, after all of this plane addition I’m considering which ones may need to be subtracted. If I were forced to sell all but the set I use the most I would be left with the no.3 the no. 4 1/2, the no. 6 and a no.7. I’ll probably hold on to at least one of each size even if they just sit on the shelf most of the time, but duplicates are likely to end up on the chopping block. The struggle of tool collector vs tool user is real! I’ll be interested to see which planes make the cut and which you let go of. I get by with a No.3, No.5 and No.8, although I do have two block planes. As I slowly work through and refurbish my grandfather’s tools I am trying to assemble a second working tool kit (including any duplicates from my tool chest) for the apprentice. Maybe your duplicates could form the basis of a tool kit for one of your daughters, James? That’s probably going to be how this works out. I’ll keep the 3, 4 1/2 , 6 and 7 in my chest and save a 4, 5, and 6 for another set to pass on when it’s time. The common struggle. My tool chest is overloaded, and that makes it difficult to find the tool I’m looking for. 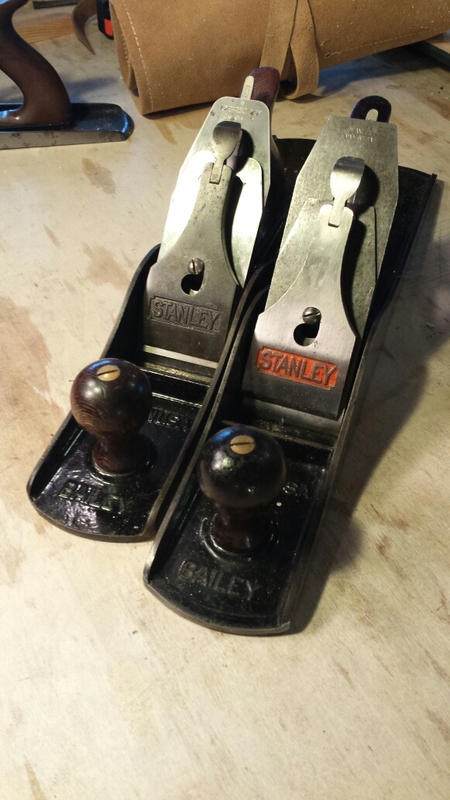 For many, many years I managed with only one plane, a Stanley No 4. It was used, with the same blade, as jack, jointer, smoother, and even (without modification) to flatten rough sawn boards. This was not very efficient, but I gained a lot of skills. Later, I added a block plane. Now I have so many planes that I can’t count them, and some have never (yet) been used productively. I still have no No 3. Must get one . . .
Having used a no.4 for a while before finally getting the no.3 I recommend the later. It’s a great plane. I’m definitely running into the problem where I have to move things to get to things, but it’s not to the point where I can’t get to the tool I want without undue excavation.